by Dr. Chen-Hanson Ting (Author), Juergen Pintaske (Editor). 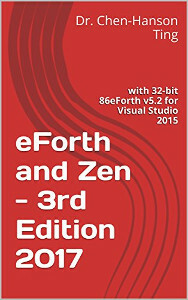 eForth has a long history, but here in this eBook you see it updated, and the 2017 edition 3 includes ports that are recent, and all of the sources are available to order, check and use - directly from Ting. It is important to have this whole range of eForth variants available, as this eForth range of implementations includes as well so called Soft Cores, which are microprocessors, targeted at Programmable devices called FPGAs. Here, a standard version supplied separately can be used in projects and in addition to the processor core the complete eForth language to drive this chip is supplied. In addition, the Core can be modified, and the modifications can be controlled by extensions of the supplied eForth software - complete flexibility to adapt SW and HW to the design.